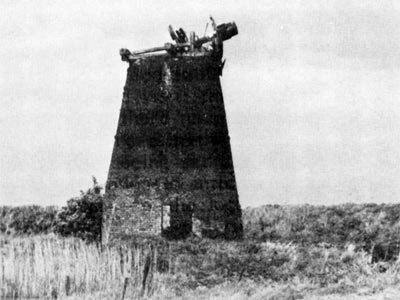 Haddiscoe Six Mile House drainage mill was also known as Chedgrave detatched mill or Hewitt's Mill and was originally in the parish of Chedgrave before the boundaries were realigned. The tarred red brick tower had doors on opposite sides. A scoop wheel was worked using common sails that were turned to wind via a wooden tail pole. 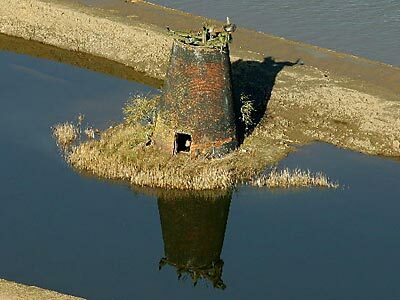 On 15th May 1989: Arthur Smith visited the mill and reported that the cap was missing exposing the cast iron windshaft with its canister, wooden clasp arm and collapsed brake wheel along with other machinery further down. A window over one of the doors had been bricked up. 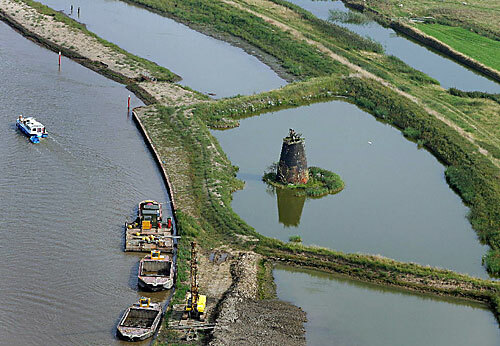 Flood alleviation work carried out during the early 2000s left the mill in a somewhat precarious position. I notice that you have a record for the drainage mill at Haddiscoe. My Great x 3 Grandfather Robert Metcalfe was declared bankrupt as miller of Haddiscoe in 1829 presumably as a corn miller unless he was too thick to realise the difference? The only land tax entry that I found for him at NRO was for renting a house and land to the value of 10 shillings in 1828 in Haddiscoe. When his widow died in 1860 on her death certificate it said she was the widow of a former miller journeyman which I understand would have been a time served apprenticeship more in keeping with working in various mills as a kind of specialised worker rather than as a miller but feel free to correct me if I'm wrong. Several years ago I was looking through some copied census records and came across some individuals not related to me but living on Mill road Haddiscoe in 1871, with one guy indicated as being the Miller living there with his wife and family. I actually went out there out of curiousity, mainly because I had seen some of the tiny houses built circa 1820-1830 and it gave me an imagined sense of family identity. The only dwelling on Mill road was a caravan situated just off the road on a private stretch of land nearby a ruined pile of bricks that obviously had once been a construction of some sort but I wasn't really able to identify it and I didn't fancy my chances approaching the caravan, with a dog in the yard, not that I'm scared of dogs but this one didn't look too friendly.